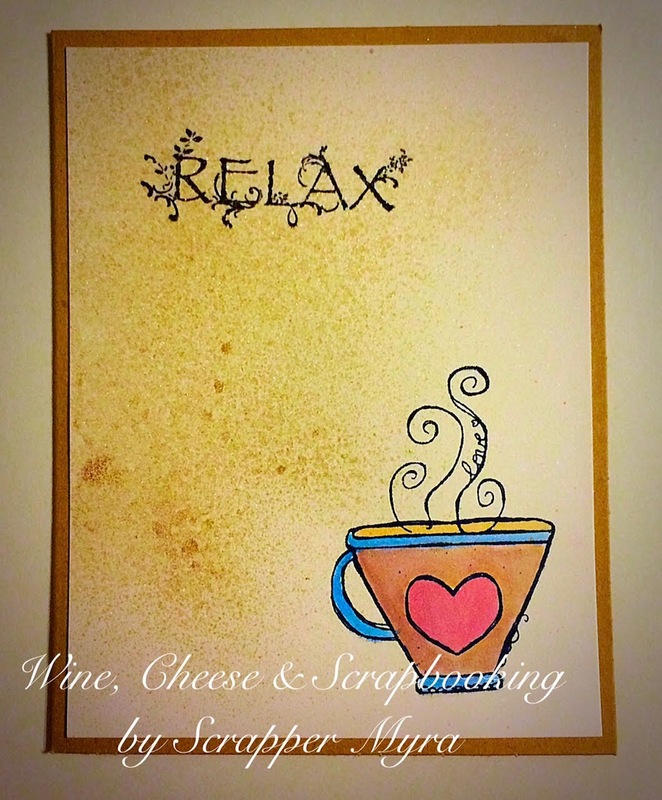 Wine, Cheese and Scrapbooking: Relaxing Friday! It's been quite a week! Today's my mom's 75th birthday. She's been recovering from surgery the last two or three months so this birthday is quite a happy feeling. I guess we can all finally relax a little knowing she's getting better and better and that 75 is a great number. Today I'm sharing a CAS card I made with the theme of Summer and Coffee. If you have visited me during the last few days, you know what I'm talking about. 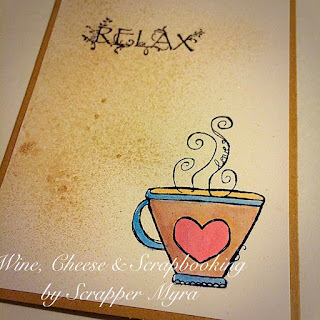 It's about a Summer Coffee Lovers Blog Hop challenge that I have entered with two cards and this is a third (and last). 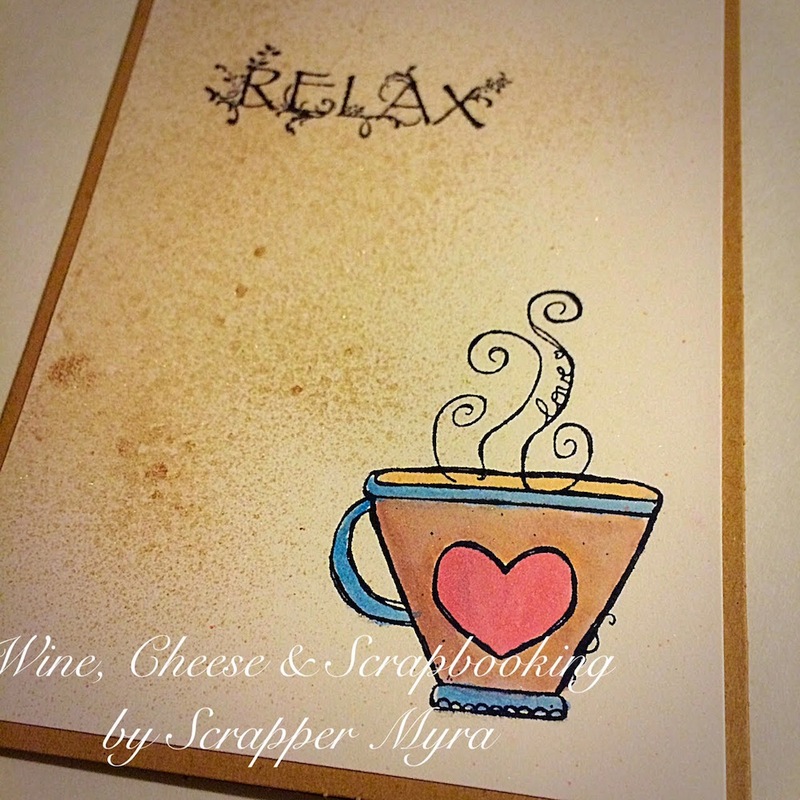 The theme called my attention and for this card I used a combination of two stamps. One is this gorgeous cup of hot beverage that can be cocoa, tea or coffee (that's for your imagination to decide... it can even be soup, right? ), and the word "Relax". I sprayed some gold color to resemble the sunshine and give a Summerish look and feeling. Do you feel it? I am also sharing this as a third entry this week for Friday's Friends with Flair from Unity Stamp Co. Leave a comment for a chance to win with Unity. Good stuff! Oh that is a relaxing card all right!! 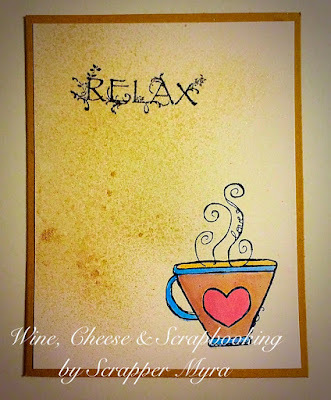 Fabulous coffee card.It's so special and peaceful. Great card! I say it's a steaming cup of tea! Happy birthday to your mom, Myra, happy 75th! Your card is lovely! Happy Saturday and weekend! Enjoyed visiting your blog! Nice card. Love your color choices. Love that great coffee mug! That inky gold spray is perfection! Super cute design! Love that cup and the spray you added. Pretty card! Happy birthday to your mom; I'm glad to hear that she is recovering nicely!